The Global Volcanism Program has no activity reports for Korath Range. The Global Volcanism Program has no Weekly Reports available for Korath Range. The Global Volcanism Program has no Bulletin Reports available for Korath Range. The Korath Range is an isolated group of tuff cones and lava flows in southern Ethiopia that were erupted along the Turkana Rift, which extends north from Kenya. About 20 tuff cones occupy the Korath Range, many of which issued lava flows from their flanks that traveled up to about 5 km. The apparent youngest flow issued from the central crater and flowed through a breach in its rim. The absolute age of the dominantly basanitic-tephritic lava flows is unknown, but a shell adhering to the youngest flow was radiocarbon dated at 7900 years before present (BP) (Brown et al., 1969). Davidson (1983) indicated an age between 30,000 BP and 7900-9500 BP. Bloomer S H, Curtis P C, Karson J A, 1989. Geochemical variation of Quaternary basaltic volcanoes in the Turkana Rift, northern Kenya. J African Earth Sci, 8: 511-532. Brown F H, Carmichael I S E, 1969. Quaternary volcanics of the Lake Rudolf Region, 1. The Korath Range. Lithos, 2: 239-260. Davidson A, 1983. The Omo River project - reconnaissance geology and geochemistry of parts of Ilubabor, Kefa, Gemu Gofa, and Sidamo, Ethiopia. Ethiopian Inst Geol Surv Bull, 2: 1-89. The Global Volcanism Program is not aware of any Holocene eruptions from Korath Range. If this volcano has had large eruptions (VEI >= 4) prior to 10,000 years ago, information might be found on the Korath Range page in the LaMEVE (Large Magnitude Explosive Volcanic Eruptions) database, a part of the Volcano Global Risk Identification and Analysis Project (VOGRIPA). There is no Deformation History data available for Korath Range. There is no Emissions History data available for Korath Range. 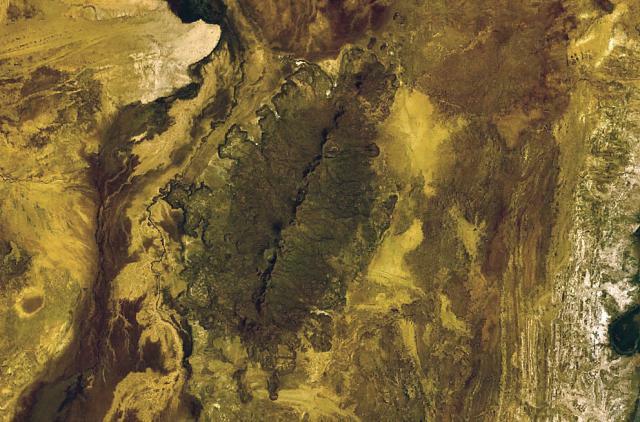 The fissure-controlled Korath Range is an isolated group of tuff cones and lava flows in southern Ethiopia that were erupted along the Turkana Rift. The Korath Range tuff cones issued many lava flows that traveled up to about 5 km, forming lobate margins, most prominently on the western flanks of the massif. The apparent youngest flow issued from the central crater and flowed through a breach in its rim. There are no samples for Korath Range in the Smithsonian's NMNH Department of Mineral Sciences Rock and Ore collection. IRIS seismic stations/networks Incorporated Research Institutions for Seismology (IRIS) Data Services map showing the location of seismic stations from all available networks (permanent or temporary) within a radius of 0.18° (about 20 km at mid-latitudes) from the given location of Korath Range. Users can customize a variety of filters and options in the left panel. Note that if there are no stations are known the map will default to show the entire world with a "No data matched request" error notice. Large Eruptions of Korath Range Information about large Quaternary eruptions (VEI >= 4) is cataloged in the Large Magnitude Explosive Volcanic Eruptions (LaMEVE) database of the Volcano Global Risk Identification and Analysis Project (VOGRIPA).